because your not even looking at the problem. In this context I'm looking at two components of it. Runaway inflation, which could be stopped, even if not reversed, by not flooding the market with more and more currency notes. And speculation -- which the government also seems to see as a huge part of the problem -- which could be stopped, if not reversed, with ONE exchange rate for everyone. ..again there will be no understanding the problem unless you look through the class war lens. the government is now a part of the problem though a problem that can possibly be forced to change from below. capital is a problem as is us imperialism and they can not be forced from below. ..in post #38 a new attempt to halt the runaway inflation but it is doubtful that it will work at this point in time because it will be sabotaged by all 3 of the problem forces i've just named. similar in many ways to greece. ..in other words you can't interject economic principles in this level of conflict and expect it to produce a remedy. Venezuela’s campesino marchers achieved their immediate objective Thursday, holding a public meeting with President Nicolas Maduro in Caracas, where they presented proposals for far-reaching reforms to state agrarian policies and institutions. Scenes of tears and cries of joy dominated the live televised meeting held in Miraflores presidential palace, in which the multitude of small farmers, who had marched 435 kilometres from Guanare, Portuguesa state, were given the opportunity to address the nation and draw the president’s attention to a series of popular grievances, including land evictions, corruption in state bureaucracy, and paramilitary violence. The meeting with Maduro was cast into doubt Wednesday night when the march arrived in Caracas only to be met by a heavy National Guard picket line just blocks from Miraflores. The weary marchers, who were accompanied by a significant number of Caracas-based social movements, decided to occupy the street in the rain, before meeting a commission from the National Constituent Assembly (ANC) headed by the body’s president, Diosdado Cabello. The following day, they received the news that the president – who had received pressure from within his own cabinet to attend the marchers personally – was to meet them. During the encounter, three campesino leaders voiced the marchers’ demands to the president and the nation in unequivocal terms. Arbonio Ortega, from Portuguesa state, explained that the anti-imperialist march was “a product of a necessity,” due to what he termed the “reverses” of the Bolivarian Revolution in the countryside. He also stressed that the march demonstrated the power of mobilisation and resistance in the sector. Equally, Nieves Rios, from Zulia state, denounced the violent land evictions currently occuring there, especially in the Catatumbo region. Amid cries of “justice, justice” she also made allegations before the president of corruption in the armed forces which, she claimed, protect “certain interests” and who are “mistreating” the people of the region. 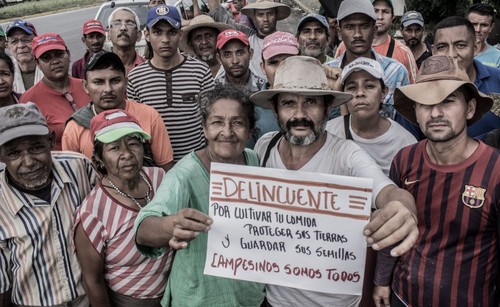 Finally, farmer Jesus Osorio presented the campesinos’ official document of proposals which he handed over to Maduro. The proposals include the declaration of an agrarian emergency, the intervention and restructuring of the Ministry of Agriculture and all of its sub-bodies – including the National Land Institute and the state-run agricultural corporation Agropatria – an audit into the ministry’s functionaries, and a review of the agrarian courts in order to halt the criminalisation of the land struggle. “If the government doesn't reach the depths of the people, then the depths of the people must reach the government,” exhorted the former bus driver. Responding to the marchers’ grievances, Maduro called a campesino congress to be held at the end of September. He also ordered a review of all denunciations made over land which has previously been taken from private large landowners and handed over to communities, campesinos, or public or state bodies. Likewise, he scheduled a high-level meeting for the following day to address the problems of land evictions, the legal agrarian system – including the appointment and conduct of local agrarian judges – all cases of alleged violence against campesinos, as well as the cases of corruption which the grouping bought to Caracas. He ordered the president of the Supreme Court, the president of the National Constituent Assembly, the attorney general, and his executive vice president to attend the meeting. At the recent PSUV congress, Maduro took the unprecedented step of publically assuming responsibility for recent economic failings, recognising that “the productive models which we have tried have, so far, failed and the responsibility is mine, is ours.” He made no specific reference to the problems experienced in the countryside. The marchers have received wide-reaching support, especially from the Communist and Tumpamaro parties and alternative media outlets, as well as elements within the governing United Socialist Party (PSUV). Analysts have claimed that the march may galvanize a host of popular revolutionary movements which look to pressure the government from a leftist position. This month has also seen protests from pro-government sectors such as the electrical workers' union and public sector nurses. There has been an unsuccessful assassination attempt on President Maduro, apparently made by explosive drones. Maduro is reportedly unharmed and arrests have been made. Firefighters reportedly say that it was a gas tank explosion in an apartment building. Photographs on social media appeared to show bodyguards shielding Maduro with black bullet-proof panels. A photograph also showed an injured military official clutching his bloody head and being held up by colleagues..."
"Donald Trump said openly that he is not against using the military against Venezuela and his government pursues a range of destabilizing tactics..."
It's like an episode of "CSI: Caracas". "Phil Gunson, a consultant with non-profit Crisis Group..."
I don't care if "Crisis Group" is an official member of MUD. Guy's got a point. I couldn't fill out a report on a stolen bicycle faster than Maduro declared Juan Manuel Santos guilty of this "assassination attempt". It's still all good though. The faster they can get to the bottom of this (which evidently they have) then the faster they can present their evidence. You'd think that when two drones explode in the skies above a large and public political event, there would have to be some plausible witnesses to this, right? A group called "soldiers in T-shirts" apparently is claiming responsibility for the attempt. From another source I read that this was a good opportunity to kill the president, and many other high ranking officials that were gathered together in close proximaty. Not sure what to think about the firefighters claim of a gas tank explosion in an appartment nearby? But I believe it would be safe to say that we won't hear more details into it. Well, unlike the drones, at least there's a photo of that. But if worse comes to worst, I guess Maduro could say "Very well, I guess it was just an explosion in an apartment after all. But it was planned and set by Columbia and the U.S. and the Opposition and those foes will not go unpunished!". It would be one way out of having to ever demonstrate any evidence whatsoever of two explode-o-drones that nobody actually saw. Well I don't trust the mainstream press for any accuracy when it comes to Venezuela. Actually seven elite guards were injured. With photos. The alleged firefighters names are never mentioned due to not being able to officially comment. And the picture of the alleged appartment gas explosion is actually pictures and video of smoke appearing to come out of a window. Mudaros is also in the video glancing up twice during the explosion that does not sound clear in the video. Not sure where that appartment building is in relation to where he is standing? Also, the guards/soldiers in formation and many other civilians do react in a paniced manner trying to flee. Clearly they believed they were in some kind of danger. Also seeing videos now of the actuall drones. One explodes and another short clip shows it crashing into the residence. Apparently this appartment building is behind where Maduros podium was. And both drones are behind. So some of this does look like an assasination attempt. But cmon Mr Magoo, really now, the only real solid evidence if this was an assassination attempt would be if Mudaros himself was killed! We get response from Alejandro Velasco, executive editor for NACLA Report on the Americas; Gabriel Hetland, assistant professor of Latin American studies at SUNY Albany; and Mark Weisbrot, co-director of the Center for Economic and Policy Research and president of Just Foreign Policy. AMY GOODMAN: Meanwhile on Sunday, the Bolivian president, Evo Morales, tweeted, “Within the last 12 months, US Vicepresident Mike Pence made 3 trips to Latin America to meet at least 8 presidents from whom he demanded support for a military intervention against our brother president of Venezuela Nicolás Maduro. Those are the Empire’s coup attempts,” the Bolivian President Evo Morales tweeted. Speaking on Fox News Sunday, National Security Adviser John Bolton denied the U.S. was behind the apparent drone strike assassination attempt in Caracas. JOHN BOLTON: Well, I can say unequivocally, there is no U.S. government involvement in this at all. Now, with respect to what happened last afternoon, look, it could be a lot of things, from a pretext set up by the Maduro regime itself to something else. MARK WEISBROT: Yes, well, I don’t have any evidence that the U.S. was behind the attack. It is kind of unusual the State Department was asked to comment, and they said they had no comment on the attack, which, normally, you know, given what the United States has done in Venezuela for the past 20 years, they would at least—you would expect them to say, “We’re against any kind of assassination or any kind of violence like that,” and they didn’t say that. But, I mean, they’ve been trying to get rid of the Chavistas for 20 years now. And the difference between the Trump administration and the two previous administrations is that they’re more explicit. As you noted, they’ve called for a military coup in Venezuela, which is something I don’t think they’ve done for 50 years. They didn’t even do that in Chile in '73 before the coup happened. They tried to—in the last presidential election in Venezuela, they tried to force—they threatened the opposition candidate who ran in the election, Henri Falcón—they threatened him for running in the election. They threatened him with individual financial sanctions against him, if he ran in that race, because they didn't want an election. So, they’re very committed to a regime change strategy, and it’s explicit, and it’s open. That’s the real difference between, you know, what they did in the past, like the 2002 coup, for example, which the Bush administration was involved in, but they denied that. And now it’s very open and explicit. And the media here kind of ignores it. They treat the United States as primarily a bystander and occasionally report when, you know, something comes out, like Trump asked his advisers if they could have a military intervention. That was reported in the press. And then they just go on as though the United States has nothing to do with any of this. So, that’s something I think that’s really important that you’re not getting in the news at all. JOHN BOLTON: These are things he’s said before, and you have to take them for what they’re worth. If the government of Venezuela has hard information that they want to present to us that would show a potential violation of U.S. criminal law, we’ll take a serious look at it. But in the meantime, I think what we really should focus on is the corruption and the oppression of the Maduro regime in Venezuela. AMY GOODMAN: Alejandro Velasco, can you respond to what he said? Not only talk about the U.S., but also President Maduro talking about the outgoing president of Colombia being behind this, Santos, who will leave office tomorrow. Tomorrow is Inauguration Day in Colombia. ALEJANDRO VELASCO: Yeah, I mean, interestingly, Colombia, even as the rest of Latin America over the last 20 years, during the so-called left turn or pink tide, most countries in Latin America were electing left-wing governments, Colombia sort of bucked that trend. And so, first with the presidency of Álvaro Uribe, who was Santos’s mentor, and then with Santos to some extent continuing that policy, Colombia really positioned itself as very much against not only Venezuela’s Bolivarian government, but, more broadly, sort of the left in the region. Of course, that relationship has become even more soured of late, since many Venezuelans have flocked to Colombia over the last year, year and a half, as economic conditions have deteriorated there. And not only that, but I think, importantly, it’s worth mentioning that many opposition leaders, including a group that fashions itself the national “Supreme Court in Exile,” actually conducts its business in Colombia, with the support of the Colombian government. And so, there’s sort of a parallel government that’s housed in Colombia. And so, all of this sort of suggests that Colombia really is positioning itself as very much against the Venezuelan government. On the other hand, you know, it’s true that Venezuela and Maduro have consistently sort of blamed Colombia, and Santos in particular, for some of these interventionist moves, and then tying it to the United States and the close relationship between Colombia and the United States. My own sense is that, at least in this case, the very kind of amateurish features of the attack, even though there was sort of the high-tech drone component to it, really suggests that it’s more of a rogue element that’s taken advantage of the sort of wink-and-nod, classic, “Yes, we will publicly condemn or even not say anything against interventionist efforts, but we’re not going to be sad if the Maduro government leaves,” right? And so, my sense is that that’s the nature of the support right now, that it’s sort of cover rather than any technical or material assistance. But, yeah, that’s certainly been the case in the past. AMY GOODMAN: And the timing of this, Professor Gabriel Hetland, the timing of this attack on Nicolás Maduro? And do you think it’s clear that it was an assassination attempt? GABRIEL HETLAND: I think nothing is entirely clear at the moment, but it seems to be an attempted assassination against Maduro. And the timing of it is disturbing, mostly because Maduro has finally done some things that need to be done in Venezuela: accepted some responsibility for the economic crisis, which has really been devastating the country, and taken some actions—not entirely adequate, but some actions—to actually move Venezuela in the right direction, specifically starting to discuss the much-needed currency reform, which Mark has written about widely for years and talked about, which is the number one factor behind the economic crisis. And so, about a week and a half ago, Maduro was making some changes. He was also sort of meeting with grassroots sectors, talking about moving Venezuela in a different direction. And all out of the blue, we get this drone attack, which could really sort of charge things up in Venezuela, move the country back to a crisis scenario and make the possibility of economic reform and dialogue with the grassroots sort of Chavista sectors much more difficult. So, it’s a sort of tragic timing, and it may not be coincidental at all. Sorry epaulo13, wasn't the first time. edited to add -BEWARE- graphic images in the below link! Probably wasn't even the second time either, but really who knows how many times the US/NATO did this? FWIW, the "drone" in your video seems to be a missile or similar, whereas I think Venezuela is claiming the use of relatively inexpensive and accessible R/C "quad-copters" which are colloquially called "drones". ..i don't know what your apologizing for. can you explain please. Drones have been used before in assasinations and or attempts of heads of state before. Regardless of it being a hi tech drone or a low tech one that probably is more dificult to trace back to the user. The top image is a military drone, such as would have been used for Gaddafi. It's 36 feet long, with a wingspan of nearly twice that. The bottom image is a "quad-copter" drone. From the tip of one rotor to the tip of the opposite rotor would be about 3 feet. It's not about "high tech" vs. "low tech" -- they're both high tech. But one is the size of a small Cessna airplane and costs millions, and the other is is only slightly larger than a toy, and can be bought at BestBuy. Interesting interview with someone who, I guess, knows a bit about (quad-copter) drones. Like Batman. His "Bat-belt" holds, what, like, six things? But when he needed a "radar shield" or a "poison neutralization spray" or whatever, it was always one of those six. Glad they thought to bring the jammers (tuned, presumably, to exactly the correct frequency!!) to save the day. I can't deny wanting to hear more about that apartment, tho. Initial reports said gas explosion, but perhaps their are little bitty pieces of drone in the apartment? And chemical traces of C4? Crazy how it seemed to go right through the window to the inside instead of splattering on the outside wall, but hey, stuff happens, right? When you're the President of Columbia, you MAKE it happen. Glad they thought to bring the jammers (tuned, presumably, to exactly the correct frequency!!) to save the day. Multi-frequency jammers aren't exactly exotic classified equipment. Bomb squads and protective details around the world use them on a regular basis. Bomb squads and protective details around the world use them on a regular basis. Presumably to block an attack that I'm told happened for the first time ever, yesterday. Still hoping to see, with my own eyes, bits of drone inside that apartment. That rudderless drone sure did thread the needle. Or to block a remote-controlled bomb, or to keep terrorists from using phones to communicate. Regardless of what actually happened in Venezuela, the potential use of (small, quadcopter-type) drones in assassinations is something that's been discussed in security circles for years. It's not a new idea. Ya actually it is about the tech. The first drone shoots weapons that have a lot of it! The second one is cheaper for good reason, it probably needs to be lighter to carry the explosive payload. A good comparison would be a molotov cocktail compared to any military explosives. But regardless, my original debate was about epaulo13's link that claimed it was the first time a drone was used for such a task. I proved it was a false claim. "Jorge Martin looks at some of the consequences of the recent terrorist attack. 'Despite the international bourgeois media ceaselessly arguing for the military overthrow of the Venezuelan president, when a terrorist attack took place with that exact aim, they tried to deny it ever took place..."
..to this day gaddafi's death is seeped in conflicting reports. you may belive one of those reports over others but you've proved nothing wwwtt. i also have no desire to continue this conversation as it distracts from some very important information that came with that post. "Former Columbian president Alvaro Uribe is recorded telling US business leaders that Venezuela's military should 'remove' Maduro." Maduro is not ruthless enough if he wants a socialist revolution in Venezuela. Firstly he needs to keep referring back to the halcyon days of Chavez. Chavez has to be brought up to cult status. Clearly, the food producers in the countryside are making the city people suffer. One alternative would be to go along the Khmer Rouge route and evacuate the cities, putting all city people in the fields as 'new people'. Another very successful alternative, as used by Stalin, is forced collectivization of the agricultural lands. People in the cities are given weapons and sent into the country to enforce the new collectivization plan, and be the vanguard of the revolution. Land owners are turned into slaves of the state, which is what they deserve for being capitalists. As you kill people off, you eventually run into a food surplus. This can be sold on world markets, and the money used to glorify the People through technological and miltary purposes. The grand dream of Bolivarian reunification will allow Venezuela to conquer neighboring states. All of the other parasites are turned into fertilizer. Maduro can rule for 60 years if he puts his mind to it. You don't need to demonize a racial or economic subgroup. You can just order the number of indiscriminate deaths necessary for each district, and the Party will obey your command. As Party members draw in and become more loyal, you exterminate them too. We have the playbook. Why is Maduro messing around? Am I engaging in thread drift? Perhaps. Am I wrong in my claim that this was not the first time a drone has been used in an assasination or attemp? Nope! If you want to post links from questionable sources epaulo13, then be prepared for more! "After partnering with the NATO/Gulf monarchy/oil company-funded ATLANTIC COUNCIL, Facebook shuts down the leading page for critical analysis of Venezuela." Banning Venezuelanalysis would have been almost like banning Maduro himself! "Expropriation is wrong and a violation of the 'free market', unless of course it belongs to Venezuela or any country targeted by imperialism." "VA's Facebook page was arbitrarily removed by the social media tech-giant on Thursday morning." I don't get how they can get rid of Venezuela Analysis' page. What freaking justification do they have for that? Given the crap that is racist and misogynist that gets a pass, I find this unbelievable. Careful, big brother is watching in the corporate controlled social media. Who knows what algorithm has captured your post for future reference? "...The government of Justin Trudeau under the leadership of Minister Freeland has pursued a deeply antagonistic relationship with the government of Nicolas Maduro in Venezuela and in a recent forum on the political situation in Venezuela, Freeland argued that Canada's 'reputation' allowed it to play a greater role in efforts to undermine the Maduro government. Freeland's office has played an outside role in regime change efforts in Venezuela and has been one of the most vocal champions of the Lima Group, the ad hoc group of right-wing Latin American countries that oppose Maduro's government. Canada's aggressive stance toward Venezuela is the clearest example of the country's move toward a more open imperialism but one that is still rooted in a long history of interference..."